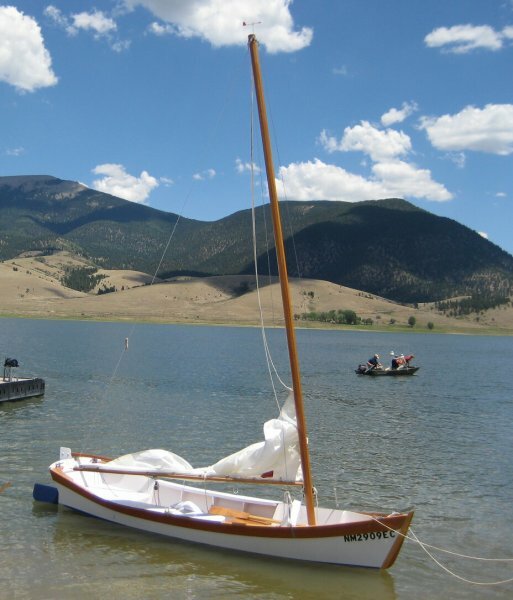 Jerry Hamilton launched SONG, a Bay Skiff 15 designed by Karl Stambaugh at Eagle Nest Lake near Angel Fire, New Mexico on September 4, 2010. during his 18 months of work, Jerry made the hull from six panels of 4x8 okoume 9mm plywood, Douglas-fir, and epoxy, then he fiberglassed the bottom to the waterline. Jerry had help from friends in his construction, including a friend who built the 18′ non-tapered bird's mouth mast from Douglas-fir. Jerry modified the plans somewhat. They called for a sprit rig of 67 sq ft, but he attached a sail track to the mast and put slides on the sail for better control.